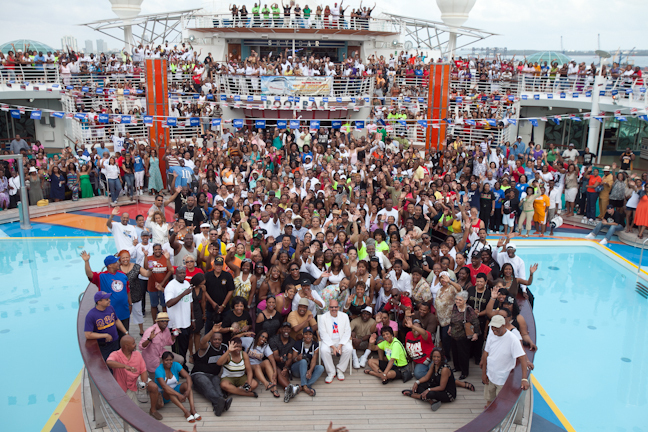 Ford, for the 2nd consecutive year, is the presenting sponsor of the Tom Joyner Foundation Fantastic Voyage cruise. The high-demand R&B cruise, hosted by radio personality Tom Joyner has taken his 14th annual Ultimate Party with a Purpose® to the next level by selling out all cabins in just 21 days! The 2013 Tom Joyner Foundation Fantastic Voyage sets sail April 7-14 from Miami, FL with a stellar lineup of today’s biggest R&B acts, theme night celebrations, exclusive concerts and numerous activities onboard a new ship from luxury cruise liner Carnival. The cruise benefits The Tom Joyner Foundation assisting students attending Historically Black Colleges and Universities. With the foundation as a 501(c)(3) charity, the cruise may be claimed as tax-deductible. Ford, who for the past seven years, has partnered with Tom Joyner to support education and students, will mark their support this year with a contest awarding a two person cabin for two different winners. The contest begins January 21st and will be highlighted on the Tom Joyner Morning Show weekdays through February 1st, 2013. Tom will be directing contestants to participate in a contest on BlackAmericaWeb.com. In addition, Ford will also provide robust visibility on the Fantastic Voyage cruise, which will include displaying the all-new 2013 Ford Fusion on the Carnival cruise liner. “Education is a top priority for Ford and we are pleased to partner with the Tom Joyner Foundation for the second consecutive year as the presenting sponsor of this annual cruise,” said Shawn Thompson, Ford manager, multicultural marketing. “Our continued involvement in this cruise allows us to play a role in helping students attending historically black colleges and universities stay the course and achieve academic success. We are equally excited about having the opportunity to introduce the all-new Ford Fusion to Tom Joyner Morning Show listeners as part of our ‘Crusin with Fusion’ national sweepstakes. Widely considered the premiere cruise and vacation experience for African-American travelers, Joyner first launched the concept of chartering and booking an entire cruise ship filled with live acts and performances in 1999. This year’s performers include Snoop Dogg’s pool deck concert with Bootsy Collins’ Rubber Band, Tyler Perry’s beach party featuring Earth Wind & Fire and the Fantastic Voyage White Party on the beach with Oscar winner Jamie Foxx. Also confirmed to entertain this year’s guest are Ludacris, Maze featuring Frankie Beverly, and The O’Jays. "Each year the Fantastic Voyage, exceeds everyone’s expectations with great parties and great entertainment...but I am most excited about what it does to keep students in school and serve the African-American community ,” said the #1 urban radio morning show host affiliated on over 100 radio stations. “Ford continues to share my commitment to Historically Black Colleges and Universities and has helped thousands of students complete their education which ultimately benefits our community, the country and the world. In addition to the exclusive live performances, 2013 Fantastic Voyage guests will enjoy stops in San Juan, Nassau and Balmoral Island with numerous activities from comedy shows to seminars, all while raising funds for students attending Historically Black Colleges and Universities. For more information on the Tom Joyner Foundation Fantastic Voyage, go to Blackamericaweb.com.